Angela tutors these certificated Master Class Skill Builders, a brilliant 5-day culinary journey through building skills for life and putting success on a plate every time. Day by day you will prepare and cook a range of dishes that will form the basis of your future every day cooking as well as some special treats to show off when you entertain. 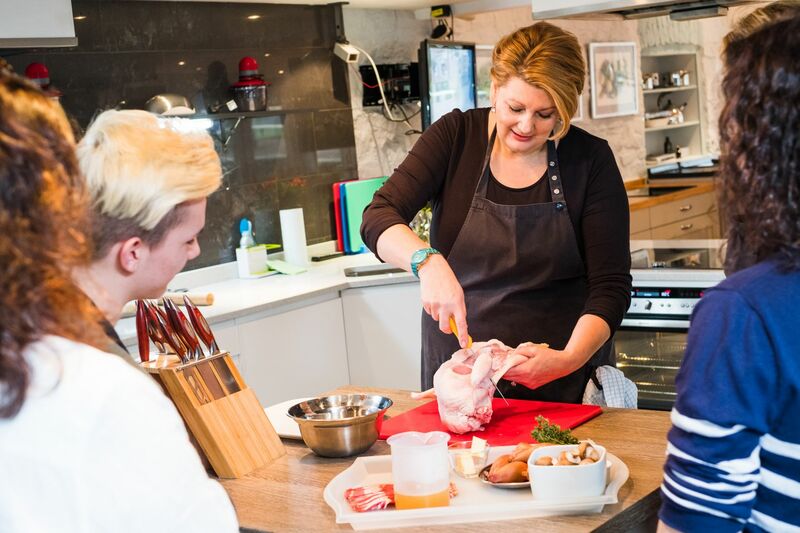 This course is perfect for people looking to improve skills, young people going off to university and those who just want to learn to cook properly. Refreshments are provided at the welcome as Angela runs through the order of the day and then it’s aprons on and into the kitchen for a culinary work out! You will take home all the dishes you make and you will also get the opportunity to taste everything demonstrated by Angela. Those who attend and complete all 5 Skill Builder Masterclasses will receive a certificate of completion. We are offering a Special Offer! You can book individual courses at £125 per day, or at £105 per day if you book all 5 Skill Builder Masterclass courses. In order to receive the special group discount, simply add all 5 courses to your basket and enter the code masterclassskillbuilder2019 in the coupon code box. £100 will then be deducted from your total. Sharpen up in this class and get the basic skills you need to slice, dice, chop and shred your way through an intensive ingredient preparation. Here is your menu. Please make sure you bring a container with you for each dish. See you in class!